Creating a budget calendar on your own can be a tedious task for sure. 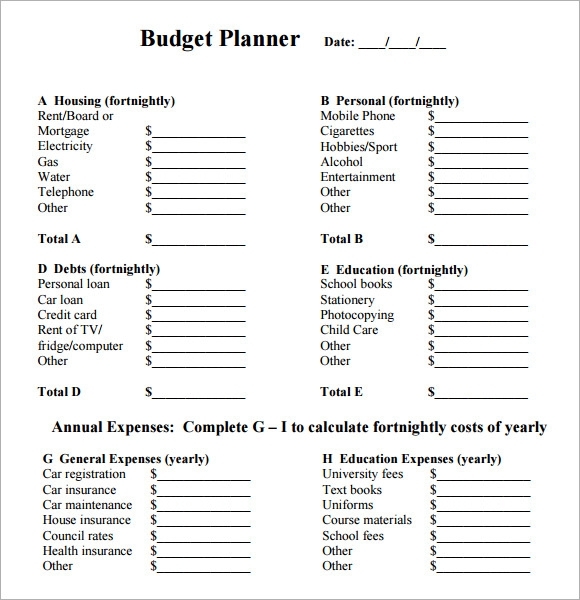 While your computer skills are all you need to get the job done, the amount of time spent on the task is definitely going to be too much, compared to the amount of time you would spend just downloading the item.The best way to go about this would be to a download free Budget Sheet Template. 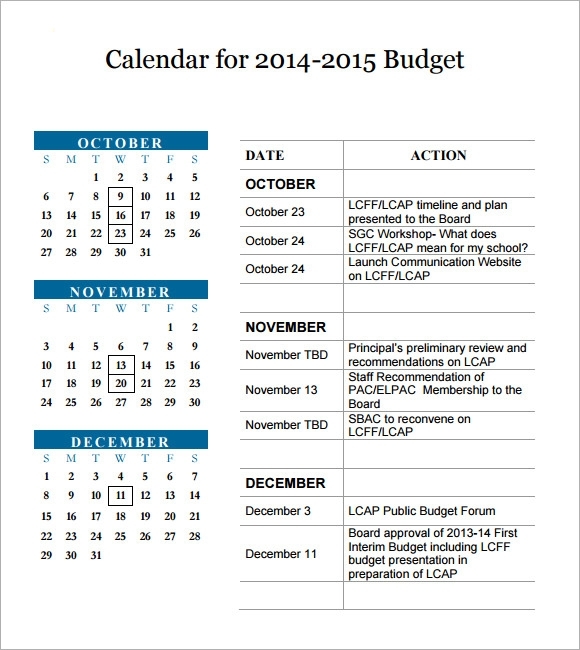 A budget calendar template is not to give you an idea on how to create your own. It is there to make your work simple , meaning you never have to bother creating one yourself as there is one already available free for download from the internet. You can also see Academic Calendars. This sample of monthly budget calendar template is a simple template that aims to chalk out a systematic plan of activities on a monthly basis. The sample has a light blue background, with the main points highlighted in dark blue color. The plan is specified as per every week in a given month for better understanding purposes. 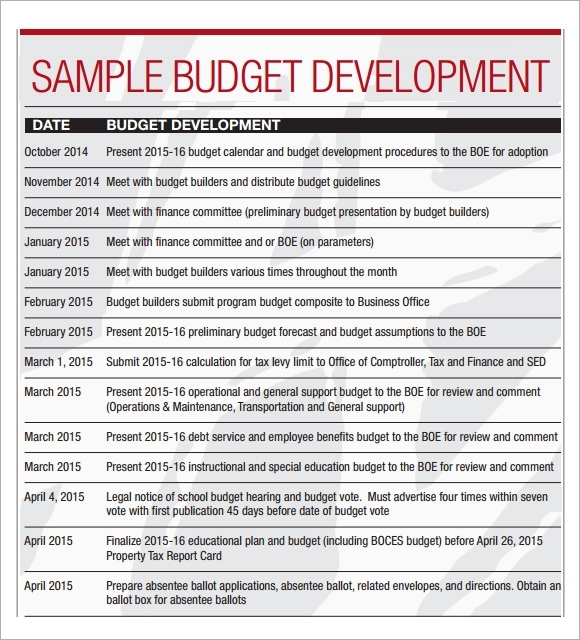 This sample of budget calendar template 2015 is a fact keeping calendar based on a daily basis. The first row of the template has four sub heads namely date, day, action and deliverables. With the help of this calendar you can easily chalk out every activity in a systematic way even if that activity requires more than 1 day at a time. This sample of budget calendar monthly activity has a user friendly and professional design. On the left hand panel a calendar of a particular month appears. On the right hand side there is a list of important dates, on which important events occur. The dates which are marked with special evets simultaneously gets highlighted on the main calendar on the left hand panel. This sample of business budget calendar template is a simple, well-structured and visually appealing template. More than a calendar this can be termed as simple notes diary, where important events from every month is listed down. The entire template has a grey background along with a black header. How Is A Budget Plan Developed? Developing a budget plan varies from one institution to the other. Typically it begins by reviewing the previous year’s expenditure and priorities. The administration looks inti various programs that were sanctioned the previous year and the success of those programs. Along with the whole total consideration of the overall financial program, a great deal of emphasis is also put on individual budget targets. 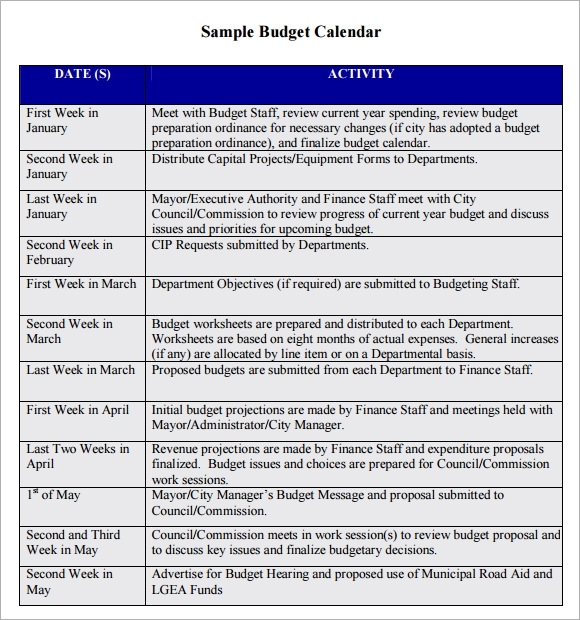 A draft budget proposal is usually presented before the final presentation and the final proposal is only submitted after the draft is reviewed and edited.You can also see Sample Daily Calendars. 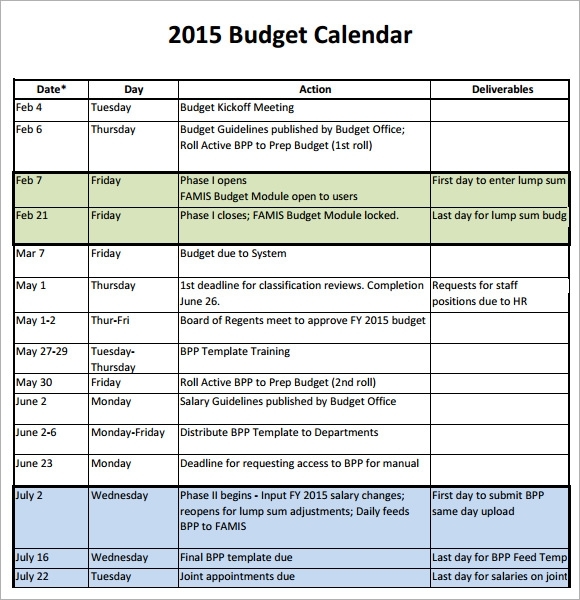 What Is A Budget Planning Calendar? A budget planning calendar is comprises of a list of scheduled activities which needs to be completed in order to create or develop a budget. These calendars are a necessity and not a luxury for large organizations who needs to create large and complex budgets. These organizations needs to gather a lot of data from different resources which calls for the need of a great deal of data several departments. All these information’s needs to be well coordinated which is further explains the need of a budget calendar. What Is The Difference Between Capital Budget And Expense Budget? The expense budget is meant for funding a company’s operating cost for one year. These includes salaries, cost of purchasing goods, equipment’s and various other fringe benefits. Capital budget is the money which is usually paid to determine, the merits and demerits of an investment project, its rate of return and various other factors. Keeping a budget calendar helps to create accountability and measurability for a company. Irrespective of what your need is, you can find both simple ad detailed budget templates on our websites, which you can download and customize as per your requirement.You can also see Sample Calendar.